This introduced plant can be a biennial or perennial. Its branched stems lie across the ground and may form mounds. Stems freely root to the ground and grow to 20 cm long. A basal rosette of leaves remains year-round, while opposite pairs of thin leaves appear in groups along the stems. Small whitish 4-petaled flowers appear in clusters of two or more. 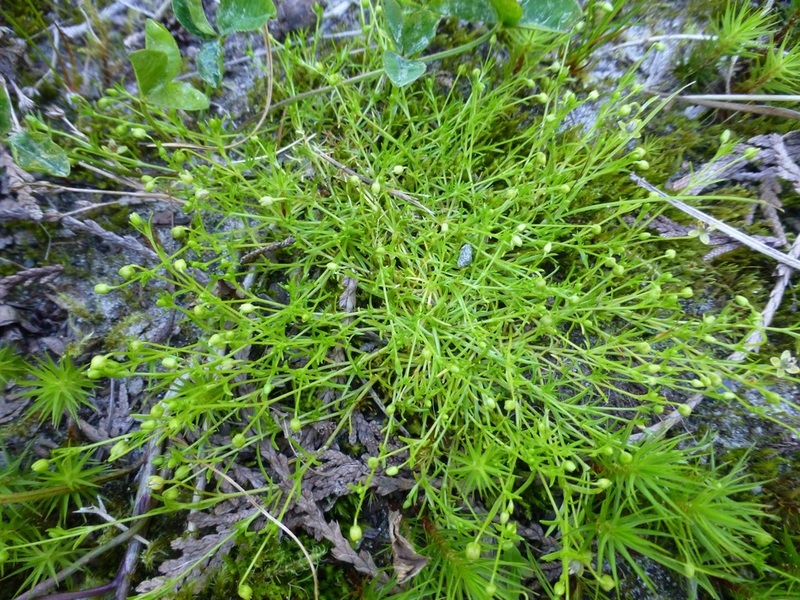 Bird's eye pearlwort grows in disturbed locations, often near areas of human habitation. Habitats include lawns, roadsides, gardens, seaside cliffs, and pond edges. It is more frequent in southwestern BC and south, and is less common from the Central Coast northward. It is native to Eurasia and North Africa, and has spread to and become naturalized in many temperate locations around the globe. The flowers of coastal pearlwort (Sagina maxima), a similar native species, have five sepals whereas those of bird's eye pearlwort have four. It is restricted to coastal habitats such as beaches and salt marshes. Atland, J. Sagina procumbens. Weed Management In Nursery Crops. North Willamette Research & Extension Center, Oregon State University. Accessed 14/01/2015. Gremmen, N. (2008). Sagina procumbens (herb). Global Invasive Species Database. Accessed 14/01/2015. Pojar, J. and MacKinnon, A. (1994). Plants of Coastal British Columbia. Vancouver, BC: Lone Pine Publishing. P. 137. Sagina procumbens L. In Klinkenberg, Brian. (Ed.). E-Flora BC: Electronic Atlas of the Plants of British Columbia. Lab for Advanced Spatial Analysis, Department of Geography, University of British Columbia, Vancouver. Accessed 14/01/2015.